Tooth loss is a fairly common occurrence. Whether through sports or everyday accidents, avulsed teeth or teeth too damaged to be saved can lead to unsightly gap in the smile. Genetics can also play a role in whether your teeth are more prone to decay and infection, causing severe tooth damage that requires extraction. Thanks to modern technology, dental implants have become the popular option to replace missing teeth and improve the health of your smile. Millidge Place Dental Clinic in Saint John, NB offers dental implants to eligible patients. 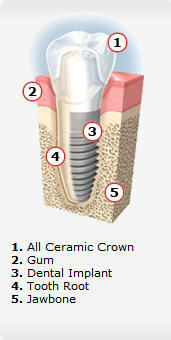 A dental implant utilizes a small titanium post used to replace the roots of a tooth. This post is surgically inserted into either the upper or lower jawbone. Because titanium is biocompatible, the implant is able to fuse with the bone and make it an anchor for the artificial tooth. The final step in the implant process involves the placement of a prosthetic tooth on top of an abutment that secures the new tooth to the implant. Dental implants are generally used to support single tooth restorations, dentures, or bridges. Each variation has a distinct advantage over traditional methods. When recommending dental implants, Dr. Murray Holburn will exam a patient’s dental condition to determine if implants will be a successful method of returning best function back into the patient’s bite while providing an aesthetic, fully restored smile that looks natural. For people missing just one tooth, an implant is often the ideal option. Unlike with other treatments, a single-tooth implant does not affect neighboring teeth, standing independently thanks to its implanted titanium post. Implants are made to fit each unique smile, blending it with your natural dentition. If any damage occurs later on, single-tooth implant restorations are easy to restore. If someone is missing multiple teeth, an implant-supported bridge may be the best solution for restoring total dental function. Traditional bridges can require the buffing down of natural tooth structures to adequately support the abutting crowns. Implant-secured bridges do not require this support. Similar to a single unit implant, an implant supported bridge is easy to restore if the event of any wear and tear in the future. These bridges are durable and will look like natural teeth, blending right into the smile.